I went a little crazy with the City Sidewalks paper and Digital Cricut Cartridge for Sous Chef Saturday over at Stampin' Buds today. I hope you'll come see all five cards. I'm over at Stampin Buds again today with a CAS thank you card using lots of layers for interest. The colors are Thistle and Slate. To color the elephant ("Emory" by Verve), I squeezed a little ink into the lids of my ink pads and used a waterbrush to fill in color. I didn't use specialty paper, so the outline image bled a little. MISTI to the rescue! I simply let the image dry, put the paper back in the MISTI, and stamped again over the top to re-oomph the outline. Re-oomph. I think I just made that word up...and I LIKE it! The stitched edges around the image panel, the fishtail banner and the very outside panel were done using various dies from My Favorite Things. For the finishing touch, I added three wraps of CTMH Thistle Thick Twine (discontinued now, darn it) and tied a knot. Time to bundle up and make a run to the post office. It's -1 outside. I'm not sure how the cold affects glue and foam tape, but I'm not taking any chances. I'm over at StampinBuds.com again today with card that uses two different CTMH Cricut cartridges. My post includes complete instructions and the cutting file. Quick post today because I need to get ready for church. I combined old and current CTMH products plus a word bubble die cut from My Favorite Things for this thank you card. The plane and "for the lift!" come from a retired set called Lifting Spirits. I colored the plane with Copic markers, used my x-acto knife to cut some of the tiny spots and my Micro-tip scissors for the rest. (Um...what took me so long to get Micro-tip scissors??? They are worth every, last penny!) The paper is long-retired CTMH. It's called Heavenly Blue. The "thanks" die cut is current CTMH. I made two of these to thank the folks who got us to and from the airport for our big trip to NYC. Now I need to write the notes, take a shower, and get ready for church. Why is it that the extra hour we get for "falling back" always seems to disappear? 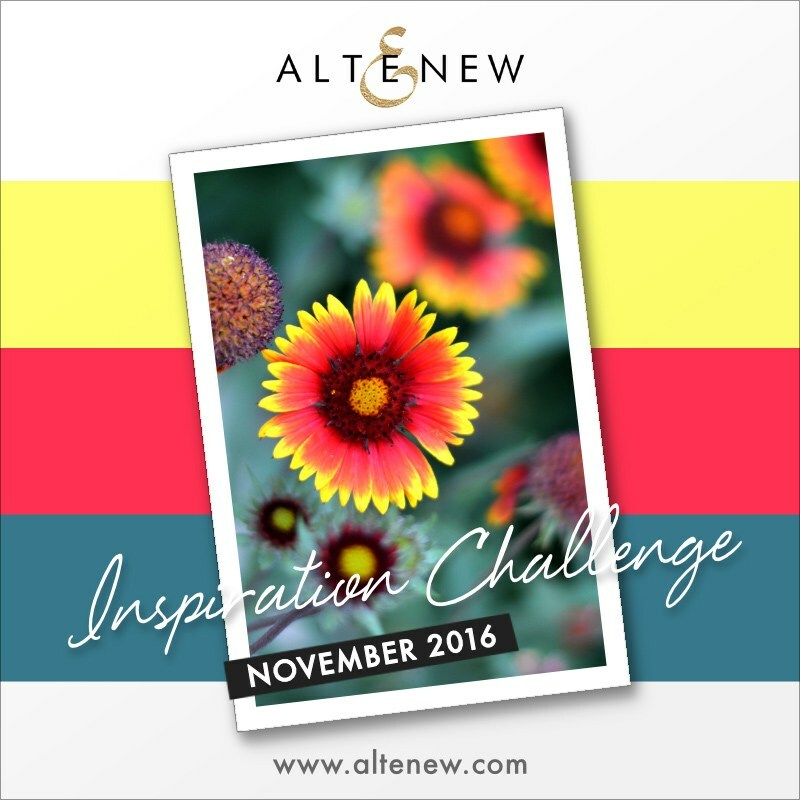 I used sketch 261 from Freshly Made Sketches and the November 2016 Challenge from Altenew. I started by embossing the flower and leaves from Altenew's Beautiful Day set in white detail powder over the smooth side of Tim Holtz Distress Watercolor Cardstock. I added the pink watercolor to the flower first, let it dry, then came back in with blue watercolor. The leaves were a single wash of yellow. After everything was dry, I fussy cut them all out with Micro-tip scissors. Using a stitched die from My Favorite Things and cardstock from Close To My Heart, I framed the word TODAY and cut. I did another cut from Pacifica cardstock from CTMH and adhered the two together. I highlighted TODAY by painting a swish of the same yellow I used to paint the leaves. I used more MFT dies to cut the white base panel and the "hello" sentiment (two cuts of white, one of Pacifica). After adding the ribbon to my base panel, I mounted everything together. Love this card...so much I might just keep it for myself! !